Earn up to 2,520 reward points. Get amazing fuzz/overdrive built to the specs of the legendary Mike Campbell. Mike Campbell is a rock ‘n’ roll institution. Not only is he a founding member and lead guitarist of Tom Petty and the Heartbreakers, but his musical fingerprints can be found on the work of such legendary artists as Don Henley, Bob Dylan, Stevie Nicks, and George Harrison—just to name a few. 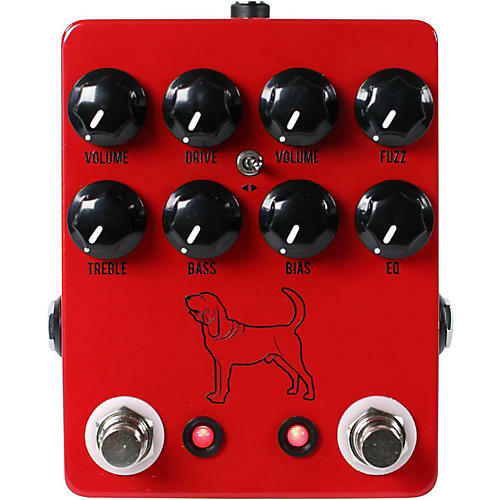 So when JHS Pedals found out that he was looking for a combination fuzz/overdrive pedal, the engineers jumped at the chance to build it for him. The PHS Pedals Calhoun signature fuzz/overdrive pedal sings with vintage character. The overdrive is carefully tuned to react and sound much like the vintage tube amps Campbell relies on night after night. The fuzz circuit delivers a '60s-style tone that will absolutely nail the “Satisfaction” sound. And the order toggle allows you to stack the circuits in any order you choose. Best of all, Campbell is lovingly donating all of his proceeds from the sale of The Calhoun V2 to the Tazzy Animal Rescue Fund. “I don’t endorse many things,” Campbell said. “But this, I’m 100% behind it.” JHS couldn’t ask for a better endorsement than that. Campbell is a notorious tone chaser and vintage tube amp aficionado. So the designers knew they had to make The Calhoun V2 sound and feel exactly right in order to get his seal of approval. Mike thinks JHS hit a bullseye. Based on the popular JHS Pedals Firefly fuzz pedal, The Calhoun V2’s fuzz circuit instantly recalls the Tone-Bendery-buzz of the British Invasion. And the added control can take you far beyond that vintage-style grit. The Tazzy Animal Rescue Fund is a not-for-profit animal rescue that helps struggling pet owners by helping provide the care their animals need. It’s a cause that is very close to Mike’s heart. In fact, he serves on their board of directors. Mike requested that all of his proceeds from the sale of The Calhoun V2 go to help fund this terrific organization. So when you buy The Calhoun V2, you’re not only getting a multitude of great tones, you’re also getting the peace of mind that comes with giving to a great cause. Dimensions: 3.65 x 4.65 x 1.2 in.